One of the diets was based on corn, 24 on corn DDGS from ethanol production (C-DDGS), one on corn DDGS from beverage production (C-DDGSbeverage), one on sorghum DDGS (S-DDGS), one on sorghum-corn blend DDGS (SC-DDGS), and one on corn DDG. The samples came from three previous experiments on digestibility of nutrients in DDGS. Table 1 summarizes the results from the three experiments. Values for AID and ATTD of TDF were greater for C-DDGS than for corn. This may indicate that grinding, heating, and fermenting corn in the process of ethanol production changes the structure of dietary fiber, rendering it more digestible. The value for AID for DDG was far lower than the mean value for C-DDGS, although ATTD did not differ significantly. The low value for AID was most likely due to the virtual absence of soluble fiber in DDG. 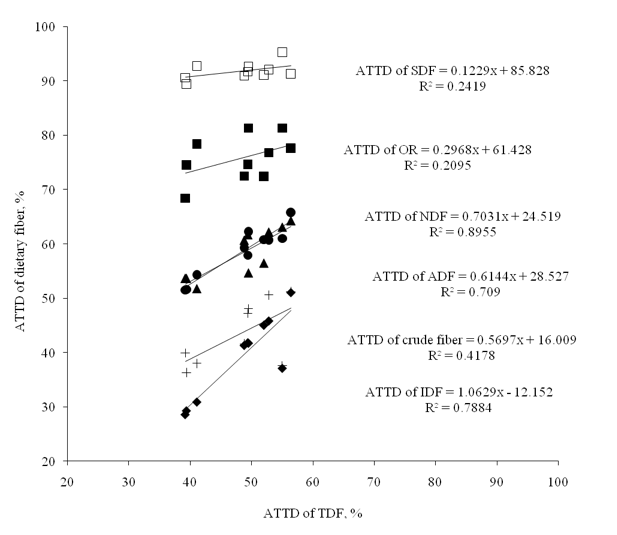 The value for ATTD of TDF in C-DDGS and the values of ATTD of NDF, ADF, and IDF are strongly correlated (Figure 2). This is most likely due to the fact that most of the fiber in DDGS is insoluble. Soluble fiber is highly digestible. One implication of this is that processes that increase the concentration of SDF in DDGS can be expected to increase the ATTD of TDF, and therefore to increase overall energy digestibility. Because the detergent fiber procedures (ADF and NDF) do not account for soluble fiber and the TDF procedure does, the value for TDF is expected to be a more accurate representation of the total fiber fraction in a feed ingredient than the values for ADF or NDF. Figure 1. Relationship between the apparent total tract digestibility (ATTD) of total dietary fiber (TDF) and the ATTD of crude fiber (+), ADF(▲), NDF (●), insoluble dietary fiber (IDF; ◊), soluble dietary fiber (SDF; □), and organic residue (OR; ■) in C-DDGS fed to growing pigs. AID and ATTD of dietary fiber varies among sources of DDGS, including among different sources of C-DDGS. These differences influence the digestibility of energy in DDGS. The AID of total dietary fiber in C-DDGS does not differ from that of corn, but ATTD is greater in C-DDGS; this indicates that the fiber in C-DDGS is more able to be fermented in the hindgut. This may be due to the processing involved in converting corn to ethanol. The greater value of ATTD also suggests that energy digestibility may be greater in C-DDGS than in corn. TDF represents the fraction of fiber in a feed ingredient more accurately than ADF and NDF, since the latter measures do not include soluble fiber. Urriola, P. E., G. C. Shurson, and H. H. Stein. 2010. Digestibility of dietary fiber in distillers co-products fed to growing pigs. J. Anim. Sci. 88:2373-2381.